Are you itching to do another real estate deal? Does it aggravate you that your money earns < 1% in your savings account because your marketing is not generating enough leads for you to buy more houses? If you’re a real estate investor who is looking for rehab properties or discounted properties, we offer a free updates via email. Once you fill out the form on the right for our VIP Buyer's list, we will inform you as soon as new properties, which meet your criteria, arrive. Keep in mind that the VIP Buyer's list is intended for real estate investors who have access to cash or hard money with crews able to do repairs and capital for holding costs. Sign up for our VIP Buyer's list to be notified of properties first before we list on the MLS and make available to all. The sign up form is on the right. 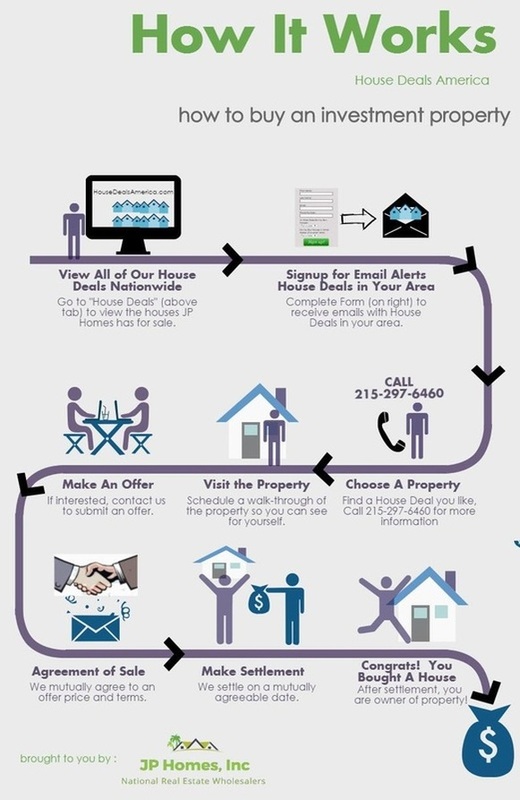 Just enter your contact information and you'll be notified first of real estate opportunities. Go to "House Deals" (above tab) to view the houses JP Homes has for sale. Complete Form on the right of this page to receive emails with House Deals in states where you buy. Find a House Deal you like, call 215-297-6460 to schedule a time for a walk-through of the property. After visiting the property, call us at 215-297-6460 to submit an offer. We mutually agree to an offer price and terms. All properties have clean title. We settle on a mutually agreeable date. After the paperwork is complete, you are the proud owner of a property where you can fix & flip, hold as a rental, or live in yourself!